Food brings people together, so we are excited to provide a venue where our customers can enjoy a great meal with friends and family this holiday season. 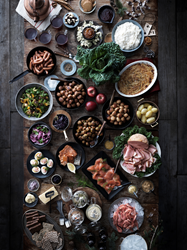 IKEA invites the public to celebrate this holiday season with a traditional Swedish Julbord buffet in the restaurants of IKEA U.S. stores** on Friday, Dec. 11, 2015. The all-you-can-eat smörgåsbord will include several courses of Swedish holiday favorites such as holiday ham, smoked salmon, meatballs with lingonberries, and much more. Tickets are available for only $16.99 per person or $4.99 for kids 12 and under. IKEA FAMILY members’ tickets are $12.99 per person or $2.99 for kids 12 and under. Seating is limited, so those who are interested are encouraged to purchase tickets early at their local IKEA stores. To locate and contact the nearest IKEA store for more details – including local seating times – visit the Store Locator page on http://www.IKEA-USA.com. For those that are not able to make it to the event, they can still bring Swedish holiday traditions home! Visit the Swedish Food Market in IKEA U.S. stores to purchase select items from the Julbord menu, including KÖTTBULLAR Swedish meatballs, or to explore, find and try other Swedish favorites – like gingerbread cookies. Knead the dough smoothly. Roll the dough ⅛ inch thick. Cut figures with pastry cutters – hearts, stars and Christmas trees are popular figures in Sweden! Bake on a baking tray with parchment paper for six to seven minutes. *IKEA FAMILY is a benefits program that offers membership perks including special product discounts, sneak previews, free coffee and tea in the IKEA Restaurant, and more. Consumers can sign up for the free program at http://www.IKEA-USA.com or in-store. **IKEA Carson will not host a Julbord event in 2015. Since its 1943 founding in Sweden, IKEA has offered home furnishings of good design and function at low prices so the majority of people can afford them. There are currently more than 360 IKEA stores in 47 countries, including 40 in the U.S. IKEA incorporates sustainability into day-to-day business and supports initiatives that benefit children and the environment. For more information see http://www.IKEA-USA.com, twitter.com/IKEAUSANEWS, twitter.com/IKEAUSA or Facebook.com/IKEAUSA, YouTube.com/user/IKEAUSA, instagram.com/IKEAUSA and Pinterest.com/IKEAUSA.